(Natural News) Green leafy vegetables have been the go-to foods for a wide range of health benefits. One of these nutritious salad greens is the Swiss chard, which can boost endurance and athletic performance and lower blood pressure, according to research. A 2013 study published in the British Journal of Clinical Pharmacology associated foods rich in nitrates like Swiss chard to cardiovascular benefits, such as lower blood pressure, improved endothelial dysfunction, and inhibited platelet aggregation. In addition, Swiss chard can help regulate blood sugar levels as well as manage and reduce symptoms associated with diabetes. This is because of it contains alpha-lipoic acid, which is an antioxidant that helps increase insulin sensitivity, decrease glucose levels, fight oxidative stress, and protect against blood vessel damage in patients with diabetes. Swiss chard is classified as a leafy green vegetable that is rich in nutrients. It contains potassium, magnesium, phosphorus, vitamin A, and vitamin C. This vegetable can also improve bone health by enhancing calcium absorption, reducing its excretion, and strengthening bone proteins. In addition, it is packed with antioxidants that can help fight and prevent cancer. Furthermore, the chlorophyll in Swiss chard was revealed to help inhibit cancer-causing heterocyclic amines in grilled meats. Therefore, it is good to have a chard salad with grilled burger or chicken breast. 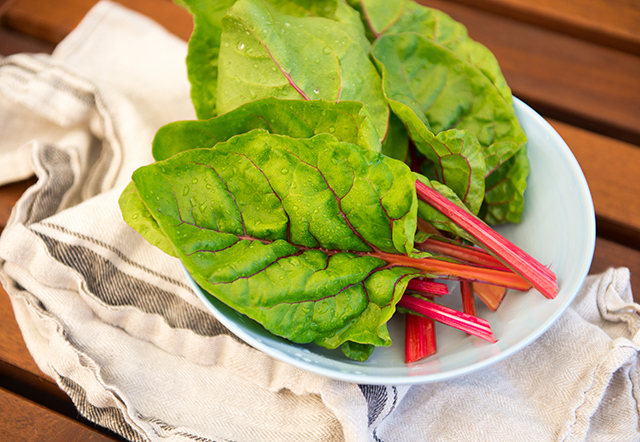 Eating Swiss chard regularly can also improve skin tone and boost energy levels. Swiss chard, also known as just plain chard, has large, fleshy but tender deep green leaves. Its stalks are also thick and crisp. Chard is similar to spinach, but with a stronger, more assertive flavor, although they are unrelated. Various types of chard have different colored stalks and ribs, with some white, golden orange, and red. This vegetable is available all year round, but its best from July until early November. Swiss chard are best when its leaves are firm and deep green. Smaller leaves are more tender and have a milder flavor. To keep them fresh, store them in the refrigerator. Swiss chard can also be eaten raw in salads, or on sandwiches or wraps. It can be braised, boiled, sauteed, or added to soups and casseroles. Scrambled eggs – You can add a handful of fresh Swiss chard leaves to an omelet or scrambled eggs. Juices and smoothies – A handful of Swiss chard leaves and stems can be added into a fresh juice or smoothie before you blend. As a topping or side dish – Sauté the leaves and stems of Swiss chard in a little amount of extra virgin olive oil. Then, season it with freshly ground black pepper, minced garlic, and freshly grated Parmesan cheese. This can be eaten as a side dish or as a topping for baked potatoes. Fresh ingredient – Swiss chard can be used as a fresh ingredient for salads, wraps, sandwiches, or flatbreads.